Just wanted to thank you for your help and send you a couple of pictures of the rifle and a score card from the 1000yd range at Bisley last weekend. Very pleased with the results as I’m still working on load development and bullet selection. Chris Potter’s for sight mounts but they didn’t have any that would work so I failed to get the rifle shot as intended at Wadhurst. I actually did not get onto a range until yesterday when I shot it for the first time. I used a 100 meter underground tube range and took three shots to zero it from the bore sighting I did when fitting the sight. Next three shots all touching using 123 grain Sako ammunition. Second 3 shots printed within previous group hole. Third 3 shots using Federal 150 grain exactly the same point of impact with no change. Nine shots now all within a 15mm diameter circle. Next 3 shots with sound moderator off to check difference in MPI achieved a ‘clover leaf’ group ¾ of an inch low and ½ an inch right of moderated MPI. To be serious, the rifle is a joy to use, comfortable and above all very accurate. Thank you very much for the prompt and professional way that I have been dealt with. What I would like to say about the .243 Woodland Stalker is that it is a fantastic rifle. After zeroing the rifle in with around twelve shots of Federal shock 70grain ballistic tip. At 125 yards I achieved a very close group. Two of the shots were touching and the third was just a few millimetres above! The rifle is unbelievably comfortable to shoot and has given a massive confidence boost in my shooting ability. 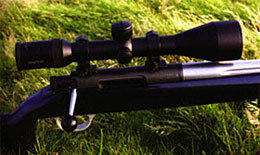 The length of the rifle including the moderator makes it easy to carry through woods and getting in and out of high seats is a breeze. I would strongly recommend this rifle. For the first time in known records a full-bore target rifle shooter has shot a perfect individual score in a ‘Queens II’ course of fire. Jon Underwood shot 150ex-150, with all 30 of his shots hitting the central V-Bull, during the Peek match of the Surrey Open on 20th September at Bisley. That is 50.10 at 300 yards, 500 yards and 600 yards with no wind coach, no hand rest and no telescopic sights. 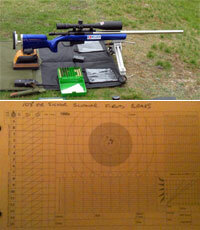 Surrey Rifle Association member Underwood used JHC 155g ammunition in his RPA Quadlock Rifle to post his amazing score. He is well known around Bisley, with notable successes as Grand Aggregate winner in 2005 Imperial; winner of all three stages of the Queen’s Prize in 2006 and numerous international honours (including a recent England Team tour to the USA). As expected, Underwood went on to win the event and also the Surrey County Championship. He is now focused on trying to get selected for the England Commonwealth Games team for Delhi in 2010, for which he is on the shortlist. The highest ever score posted in the actual Imperial Meeting Queens II event is 150.28, shot by Scotland’s Iain Robertson in 2002.